While bass amps seem to be getting smaller daily, apparently "bigger is better" in the world of guitar amps. 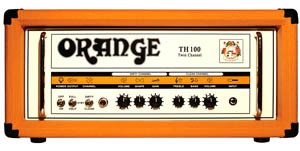 Expanding on the success of its popular TH 30 guitar head, Orange Amps continues the range with the new TH100 head, the 100 watt big brother of the TH30. The TH100 has exactly the same controls and pre-amp section as its smaller sibling, but when running in class AB1 (half power) it makes 35 watts on two output tubes and 70 watts on four output tubes. Put it to full power (AB2 position) and the amp makes 50 watts with two output tubes and 100 watts with four. Being able to switch to half power means you can reduce the listening volume while preserving the power tube distortion. Just like the TH30, the TH100’s design features the best of the Rocker and TH Series, with two channels. The clarity of the classic vintage sparkling sound on one channel plus the stunning overdrive / distortion with its British tone crunch on the other, makes this a very classy amp. The new head will come with four EL34 tubes, four 12AX7 pre-amp tubes and a 12AT7 for the low impedance FX loop. It will also have four internal bias pots so the output tubes can be matched into the amp by a qualified technician. In terms of size and weight it will be comparable to the Rockerverb 100. This mighty head delivers more tone, greater power and more features. With this knockout combination the TH100 will be the driving force behind your sound! Price for the new TH 100 head was not immediately available. For more information visit www.orangeamps.com Or to take a look at the TH100 as well as all the other Orange Amps go to Orange Music Booth 4674 Hall C at Winter NAMM in Anaheim from Jan 13-16. 2011.